I pulled out the two containers of my collected scarves, dumped them out and started sorting by color combinations. It didn't take me long to realize that I was leaning heavily towards the browns. There is one scarf that I'm sure will be incredible right in the center, so continued to select contrasts to go with it. Then, the least fun part, fold all the ones not selected and put bac away. All the scarves have already been washed ... I do this before I put them to inventory. Last week I'd pick up some a very lightweight fusible interfacing. 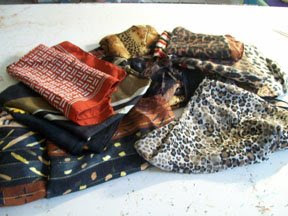 The plan is to iron on to the back of each scarf to make it just a bit more sturdy. I'm not sure this step is necessary, but it's what I decided to do. Set up a big thick towel on my drafting table and started the process of ironing and attaching the fusible interfacing to the back of each scarf.